September is National Preparedness month in the United States so I focus on earthquake preparedness. My food storage focus in September is what I like to call meat and potatoes. I buy tuna in April, chicken in September, and beef in October for our food storage. I keep canned meat in the house even though we typically eat fresh or frozen meat because it will be so useful during a disaster. And as long as we have rice and beans, we have a complete protein on hand. I keep about a 3-month supply of canned meats and I only buy meat my family will eat with our regular recipes. It's easy to through in a stew or casserole. Shopping for meat throughout the year spreads the expense. In September, I buy canned chicken at Costco or Sam's Club for about $2.00 per can. You can also buy it at the Utah case lot sales. 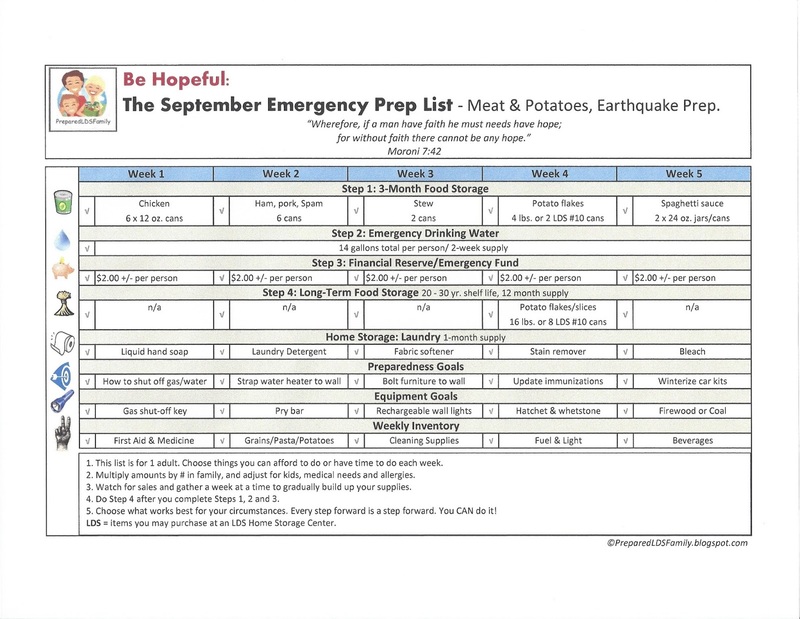 My September Emergency Prep list suggests gathering chicken and a pork-type product for each person, but you can adjust the items and amounts on the list however you wish. I leave pork on the list because those of you with little kids might want Vienna sausages. I don't have any Spam eaters in my house, so I mostly buy chicken. Canned chicken can be used in a variety of recipes such as chicken pizza, chicken stew, chicken salad sandwiches and chicken tortilla soup. It is something I use a few times a month, and I love the convenience. You know this semi-homemade food storage queen does not can her own chicken, but some of my amazing friends do with their canners. You can find some basic recipes on my Canned Chicken Recipes Pinterest Board. Let's talk about potatoes. Those that have a short-term shelf-life typically come in boxes or cans, and the long-term flakes come in #10 sized cans. For short-term storage, I buy Honest Earth Creamy Mashed Potatoes (made by Idahoan Foods) from Costco for about $10.00. There are 14 pouches in the box with 8 servings each or .71 cents per meal or .09 cents a serving. It's great to use as a side dish for dinner when you don't have time to prepare fresh potatoes. However there is nothing like homemade mashed potatoes. Instant potatoes DO NOT have a long shelf-life because they are made with a little butter or oil. Maybe a 3 - 6 month shelf life. Or you could store a bag of fresh potatoes, which are very inexpensive. For long-term storage, I buy the instant potato flakes from the LDS Home Storage Center or online at store.lds.org. These LDS potatoes have a shelf-life of 30 years if stored in 75 degrees or less. Because butter is not an ingredient, they have a long shelf life. Each can is about $36.00. Here is a Pinterest Board with Potato Flakes Recipes. For emergency preparedness, practice Drop! Cover! Hold on! with your family. Children learn quickly and repetition helps them know what to do wherever they are if the ground shakes. Learn how to practice Drop! Cover! Hold On! here. My spiritual theme for this month is Be Hopeful. We are so blessed in this nation. As we continue to have hope and faith in God, we can accomplish miracles. Never give up hope when the world is falling apart. Have hope and walk in faith. 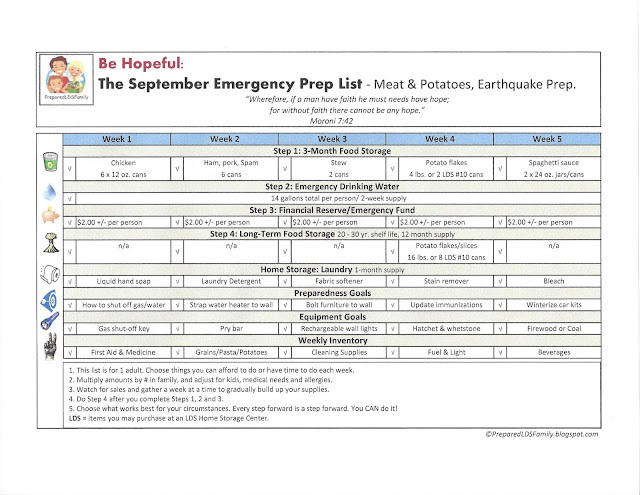 Go here to print my September Emergency Preparedness List.pdf shown above. I love this and am so using this from now on. I have dealt with hurricanes and floods, and this is something I really need to make a priority, self sufficiency. 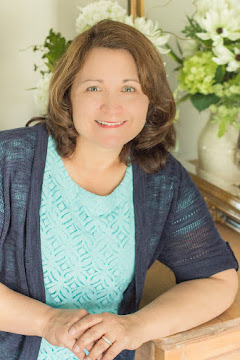 This is a wonderful blog! Thank you! I'm so glad you are working on preparedness. It will bring you blessings. Have you ever bottled your chicken? I buy it from Zaycon Foods for cheap and do a bulk bottle/canning sesson. My family loves the taste better than canned chicken, and it's cheaper!